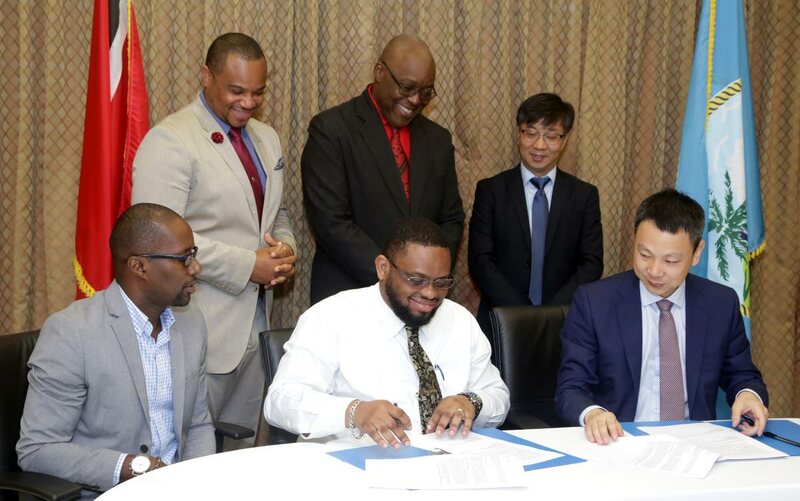 Ritchie Toppin, Administrator in the Division of Infrastructure, Quarries and the Environment, (front, centre) signs a Memorandum of Understanding (MOU) between the Tobago House of Assembly and the China Railway Construction Caribbean Co., Ltd (CRCCC) as executives look on. Looking on are, at right front, Yan Meng, Managing Director (CRCCC); front left, Dunstan Dennon, Advisor to the Secretary, Dunstan Denoon; Back (from left) Councillor Kwesi Des Vignes, Infrastructure Secretary; Kelvin Charles, Chief Secretary of the Tobago House of Assembly; and Mr. Feng Laigang, Vice President, CRCC International. FOUR engineers from the Division of Infrastructure, Quarries and the Environment (DIQE) will undergo professional development by ways of internship programmes as a Memorandum of Understanding (MOU) has been signed between the Tobago House Assembly (THA) and the China Railway Construction (Caribbean) Co, Ltd. (CRCCCL). The MOU signed at the Executive Conference Room of DIQE on Wednesday seeks to formalise the agreement and partnership between the two institutions for knowledge transfers to local professionals and institutional assistance in the engineering industry. Addressing those gathered, THA Chief Secretary Kelvin Charles said that the Assembly looks forward to the cooperation, while ensuring that the arrangement is a successful one. “The Assembly shall provide four engineers with basic knowledge of technical or engineering principles in the classic engineering fields: civil, electrical, mechanical and industrial engineering for short term settlement or assignment to the contracting company of China Railway Construction Caribbean Company Limited. It will range... I understand between three to six months and it would be done on a rotational basis. “In that regard, I am sure the exposure, the training, the contemporary practices of construction management will do well with our engineers. Understand the significance of this moment, it is not one to be treated with lightly, it is a fundamental issue with tremendous possibilities. We are happy to be engaged with you in this exercise where you would be providing some exposure to our engineers as they seek to develop further and strengthen their capabilities,” he said. Charles declared the signing ceremony as “quite historic”, noting that this initiative has been in the making for quite some time. “...but thank God it has come to a realisation after the initial seeds were sown… it has now germinated. Consistent with this administration’s approach to the development of the island of Tobago, we have stated as part of our process going forward that not only would we build Tobago community by community, but we shall enhance the delivery of projects in Tobago by strengthening partnerships,” he said. This signing ceremony comes on the heels of a November 2017 visit to China for the China-Latin America and the Caribbean (CLAC) International Exposition in Zhuhai, Guangdong Province, China by both Charles and Secretary of Infrastructure, Quarries and the Environment, Councillor Kwesi Des Vignes. The trip, which was on the invitation of the Embassy of the People’s Republic of China, included attending the launch of the Hengqin China-Latin America Economic and Trade Cooperation Park in southern China’s Guangdong province, which was expected to boost economic ties between China and Latin American countries. DesVignes said that during the trip he was so amazed that he felt it best for Tobagonians to benefit from the learning experiences as well. “We thought that our engineers can best benefit from a partnership between the THA and CRCC Caribbean. Here we are today, charting the way forward so that my engineers can really learn from the exchange, best practices, from the company CRCC and the cultural practices in terms of project management. In terms of even new technology and being exposed to new technologies and other best practices (they would benefit),” the Secretary said. Managing Director of CRCC Caribbean Yan Meng noted that as an international company, CRCC also undertakes its social responsibilities as they are willing to contribute to local communities. “Dating back to the meeting between our Chairman and your Chief Secretary in July 2017 in Tobago, both of you expressed a willingness to establish a partnership in the field of training on the technical engineers. CRCC would like to use our rich experience of engineering to improve the technical level for the local engineers. The signing of the MOU is the first step in the cooperation,” he said. Meng said that Tobago holds a special place at CRCC, as the company began working on the island in 2007, with the construction of the Scarborough General Hospital in Signal Hill, which he said was their first project in the Caribbean. “Since then, CRCC has extended our business from Tobago to other Caribbean regions including Suriname, Panama, Dominica. We are also working on several projects in Trinidad such as the Arima Hospital project and Curepe interchange project. To some extent, Tobago is our starting point and is a route of CRCC in the Caribbean region,” Meng said. Reply to "THA signs ‘historic’ MOU with China Railway Construction"